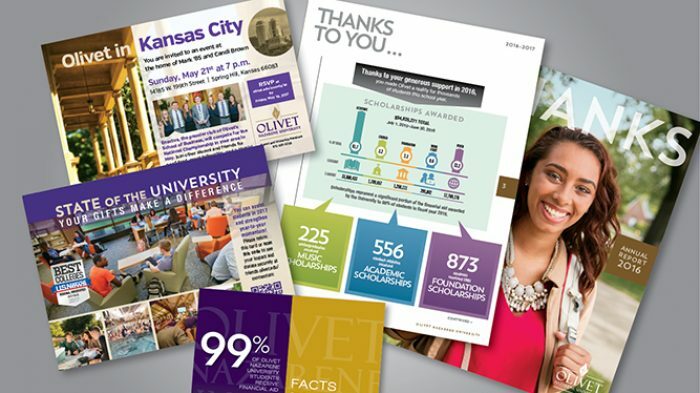 Olivet Nazarene University manages the majority of their design in-house, but needed help developing and executing pieces that could retain a personal touch across large audience segments. At Liberty, we maintain cutting-edge variable printing technologies and a large production team that can easily fulfill large orders. Using our resources, we have helped develop and implement multiple direct mail campaigns and marketing pieces that communicate broad and/or targeted messages to thousands of prospects — without ever sacrificing the personalization that sets Olivet apart. Together, Liberty and Olivet have implemented marketing pieces and communication plans that effectively showcase the Olivet brand and spur action from prospective students — a part of the strategy which has helped Olivet maintain and/or grow enrollment every year.